Denton, TX, January 23, 2019 – The CBS ArcSafe® RSA-242 remote switch actuator has been named Plant Engineering magazine’s 2018 Product of the Year in the Safety category. The RSA-242 is designed to safely and remotely operate the ABB/Sace Novomax air circuit breaker. This award is CBS ArcSafe’s fourth product of the year honor from Plant Engineering for innovative safety products that protect electricians and maintenance personnel from arc-flash danger. "Plant Engineering subscribers, who buy or identify these types of products for their plants, vote on the product finalists,” says Tommy Phillips, general manager of CBS ArcSafe, Inc. “Because the voters are responsible for using these products on a daily basis, we truly value such a distinct honor. This type of acknowledgement keeps our team excited and energized to design and manufacture the highest-quality solutions to protect workers worldwide." The RSA-242 allows technicians to remotely close or trip an ABB/Sace Novomax air circuit breaker from a safe distance of up to 300 feet, well outside the arc-flash boundary. 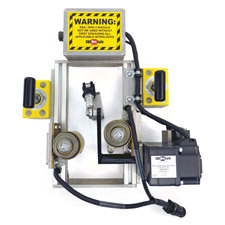 Installation and operation do not require any modifications to existing electrical equipment, thanks to CBS ArcSafe’s magnetic latching system. Typical applications include general protection of low-voltage primary and secondary distribution, generators, motors, transformers, and capacitors. When compared to other arc-flash mitigation alternatives, the RSA-242 is a cost-effective solution for keeping operators safe. CBS ArcSafe previously won Product of the Year awards from Electrical Construction & Maintenance magazine (2012, 2016-2018), Occupational Health & Safety magazine (2012-2017), and Plant Engineering magazine (2009, 2014). Other CBS ArcSafe product honors include Industrial Safety & Hygiene News magazine's Readers' Choice Award (2015). CBS ArcSafe offers the electrical industry’s largest inventory of remote racking and switching solutions for low- and medium-voltage switchgear. The systems operate without modification to existing electrical equipment and allow technicians to operate equipment from a safe distance of up to 300 feet. All CBS ArcSafe equipment is manufactured in the United States at our Denton, TX, and Charleston, WV, facilities. CBS ArcSafe offers 24/7/365 emergency support and is happy to develop custom remote racking and switching solutions for customers. Learn more at CBSArcSafe.com or call us toll-free at 877-4-SAFETY.